Consumer's are being led to believe that every aspect of their computing experience is constantly under threat, to the point where they can't even trust the software they download to their computer. With this in mind, we need a secure location we can trust to obtain our software. Heimdal, which is available in a very basic FREE and paid PRO version, is a powerful security tool which you can use to offer a second-layer of security on your PC, in addition to your regular security suite. What it does in its basic form is check your computer, examine the software you have installed on your PC and then check for updates. It will then download them securely for you. In addition it will protect you from the latest malicious software and similar threats. 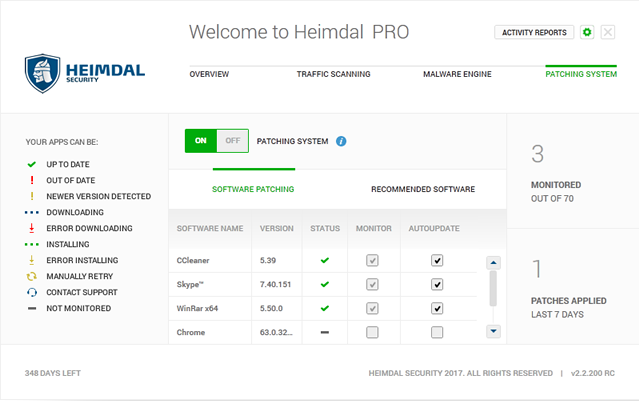 Heimdal PRO offers a whole host of additional security safeguards. You get traffic-based malware detection, proteection against accidentally installing malicious software (from third-party sources), a DarkLayer guard which will stop you from browsing a potentially malicious website and much more.